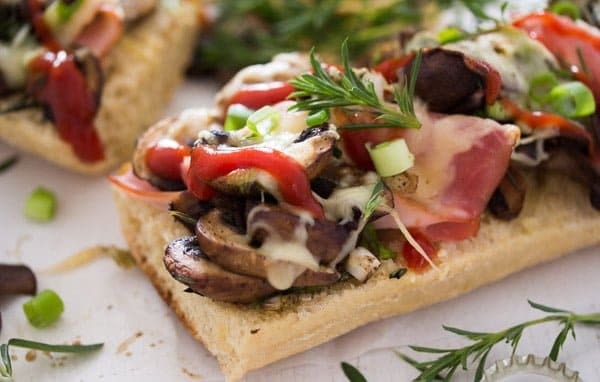 Some kind of pizza sandwich: Polish zapiekanka – open faced toasted sandwiches topped with fried mushrooms, ham and cheese. A Polish recipe for you again today, I have quite a few of them on the blog, for instance the recipe for this Polish Bezowy Cake, one of the best cakes I have ever eaten, made with meringue and filled with mascarpone. Or the Polish Kasha, which is roasted buckwheat with mushrooms and onions. 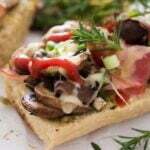 The recipe for these sandwiches contains mushrooms as well, they are very much loved in Poland, I have tested many Polish mushroom recipes, some I cooked myself, some we had during our holiday in Poland. Zapiekanka is a popular Polish street food consisting of half a baguette, topped with fried mushrooms and cheese and toasted in the oven until the cheese melts. Afterward you squeeze some ketchup on the baguette and there you have it, some kind of pizza sandwich, hot and delicious! Zapiekanka reminds me very much of the kind of pizza we used to eat as teenagers in Romania. It took a while after the fall of communism for pizza to come to our towns. We knew about it, but couldn’t get it anywhere and later, when the first pizza place really opened in my town, we could not have afford it anyway. And as there was no internet available either during the mid 90’s, we couldn’t even search for a recipe either. Imagine that!!! So, we had our own version of pizza. We would take old white bread slices, sprinkle them with milk, put them on the baking tray and top them with Romanian cold meats. Then we would beat 1 or 2 eggs with some tomato paste and pour that on top. Sprinkle some cheese over and bake. The sides were crunchy and the rest a bit soggy, if I remember correctly, but we loved it! We used to make this kind of pizza very often when my friends were coming over. Zapiekanka appeared for the first time on the streets of Poland in the 1970’s, but it became really common at the end of the 1980’s when the communist laws regarding private enterprise started to loosen in the country. This lead to the spread of food trucks selling zapiekanki, French fries, sausages or rotisserie chicken. There are many varieties of zapiekanka. It started with the mushrooms and the cheese, but people kept adding stuff to it to make it more interesting. I decided to add some ham myself to my zapiekanka, mostly because of the children, they both HATE mushrooms, although none of them has ever even tasted them consciously (only pureed in soup or cooked beyond recognition in other dishes). Well, there is no easier task than this. Start with frying the mushrooms. 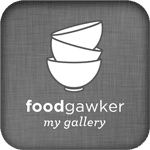 I don’t know about you, but I absolutely love pan fried mushrooms, I make them often for my husband and I and we often have them on another kind of open faced sandwich topped with a poached or fried egg. 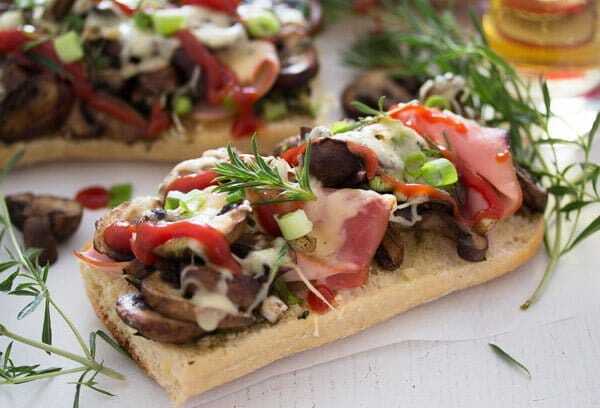 I cooked the mushrooms for these Polish zapiekanki sandwiches the same way. Just a little butter, some herbs and salt and pepper. Get some nice baguettes and slice them lengthwise. 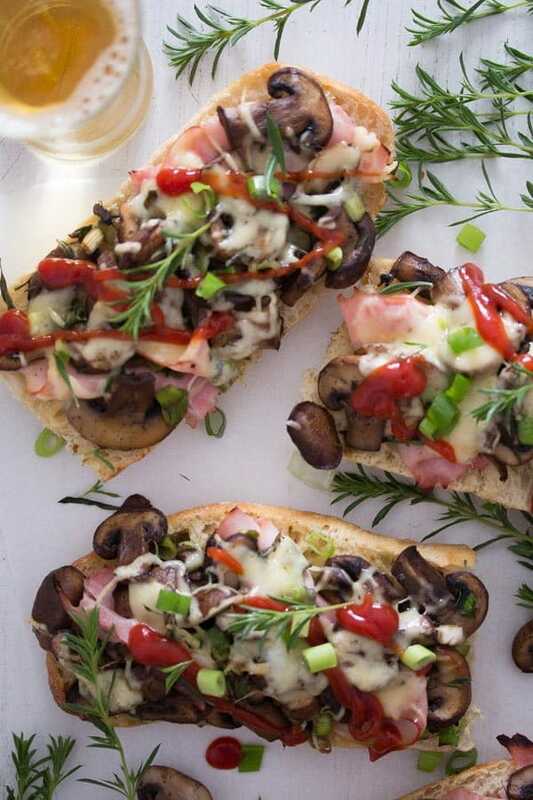 Top them with the pan fried mushrooms, some thin ham slices (optional) and grated cheese. I used Gouda cheese, but Cheddar, Gruyere or other similar cheese that you like is OK.
Toast the zapiekanki for about 5 to 10 minutes or until the cheese is nicely melted. Enjoy with some thinly sliced scallions and ketchup on top. Or Sriracha sauce in my case, because I like things a bit hotter and I really cannot stand ketchup. 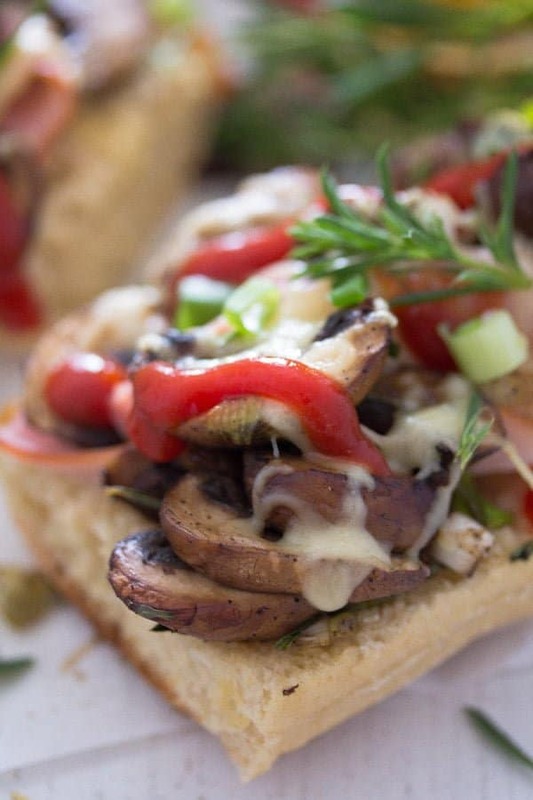 Toasted Mushroom and Cheese Sandwich – Zapiekanka can be assembled ahead, covered with cling film and refrigerated until ready to bake. Preheat the oven to 160 degrees Celsius/ 320 degrees Fahrenheit. Line a baking tray with baking paper. Clean the mushrooms with kitchen paper and cut them into slices. Heat 1 tablespoon butter in a cast iron or a non stick pan. 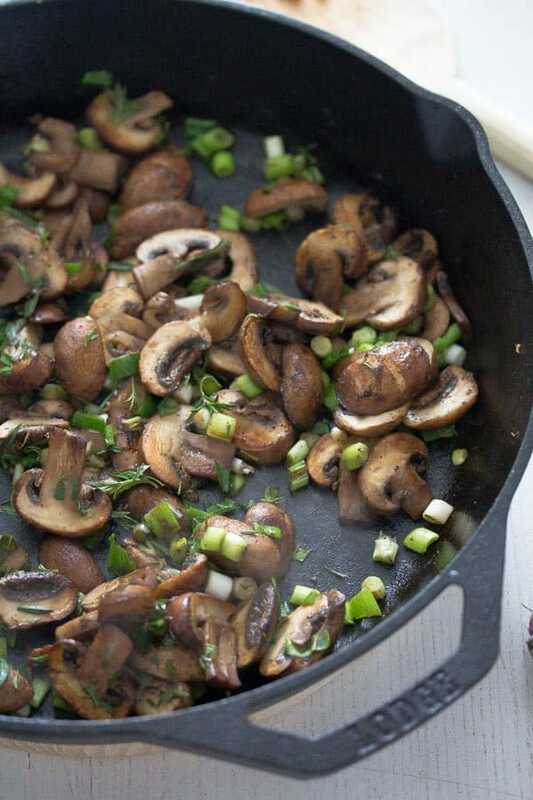 Fry the mushrooms for about 3-4 minutes or until golden brown. Add the chopped thyme leaves and salt and pepper to taste. Set aside. If using a long baguette, cut it in half first and then cut the halves lengthwise. If using small baguettes, halve them lengthwise. Spread a thin layer of butter onto the baguettes. 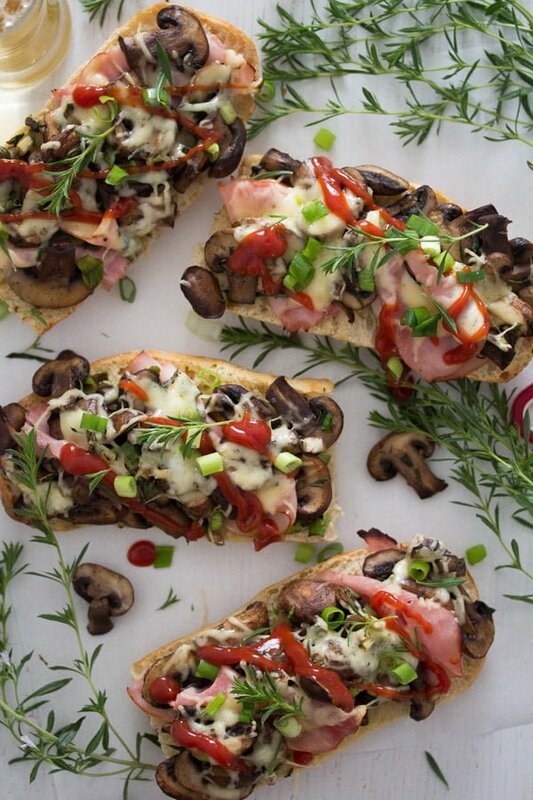 Top the baguette halves with the fried mushrooms and the sliced ham. Sprinkle with the freshly grated cheese and some pepper. Toast the baguettes in the hot oven for 5 to 10 minutes or until the cheese is nicely melted. Sprinkle the baguettes with thinly sliced scallions and serve hot with ketchup. My kind of food….looks so inviting loaded with mushrooms. Looks amazing! I love this kind of pizzas. Today I’ve had pizza for breakfast, a naan-pizza, made pretty much the same, but without the mushrooms. I remember the milk-pizza, not my favourite. :)) I fully agree with your description. My mother used to make another pizza with a thick crepe mix, I liked that a lot. She made the Italian style pizza too, as she had it in Italy, when she went there as a teenager. I haven’t been to Poland for many years and haven’t heard about all these variations of zapiekanka! I only know the mushroom and mushroom+ham one! Your zapiekanki look fabulous! I also make them quite often when I want something warm, but quick, though they never look even half as good as yours! (By the way, mine are fantastic with the Indian sauce I’ve recently posted! I forget how often I use it!). I like both ketchup and Sriracha. I’ll probably use both on this for good measure 🙂 This looks delicious, Adina! I was looking for something for our lunch tomorrow and here it is. I have all of the ingredients so it obviously was meant to be. Thanks for another recipe idea! I bet this will go down a treat for me. My kids will love this too if I take out the mushrooms ha..ha.. what’s wrong with these kids 🙂 I love mushrooms!